In a city like Venice, also to get lost is charming. Especially at night. If you prefer to take a chance and learn to orient yourself in the Calli, Rami and Corti, follow our advices, but hurry up: to the Venice Night Trail, the first appointment of the VMCevents 2017, you do not have so much time left! We are approaching step by step to the first race of the VMCevents 2017, the Venice Night Trail. Find your way around Venice is considered by many visitors, confused and disoriented by the many Calli, Rami and Corti that sometimes end in a deadlock as a channel or a door, a kind of undertaking!! If to the complexity of the urban road system we add the darkness of the night, Venice can turn into a real labyrinth! People have two main ways to find the way around Venice and enjoy its beauty at the top: the first one is to rely on a local guide who will lead you easily through the most charming places, the other way is to proceed in the old way, by taking with you the city map… and your goodwill! The first solution is more convenient, the second most adventurous. Moreover, the mapping is always an integral part of Venetian history. 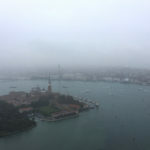 The Serenissima based its prosperity on international maritime trade in goods and for this reason having excellent sailing navigation capabilities was a must for Venetians. Alvise da Mosto, who discovered the Cape Verde islands, Giovanni and Sebastiano Caboto, the discoverers of Terranova and Labrador (today’s Canada) and whose house is situated at the beginning Via Garibaldi in Venice, but also the famous Marco Polo who in “Il Milione” tells his journey to China and the subsequent return by sea to Venice: they are just some of the famous explorers who demonstrated the great ability of Venetians for shipping and exploring. When it was not possible to rely on the convenience of a Garmin equipped with GPS, going by land and sea and exploring new territories required, as well as great enthusiasm and determination, a significant technical and scientific knowledge. Over the century there have been created many inventions which helped the explorers and the sailors for this aim. An example is the Fra Mauro’s “Mappamondo”, a masterpiece of the 1450 ca., which is preserved in the Biblioteca Marciana in Piazza San Marco. 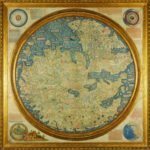 More specifically it is a map of the world made by Fra Mauro who was a monk of the order of San Benedetto and who lived and worked for a long time in the monastery of San Michele island in Venice. This map is a manuscript made on parchment sheets glued to a wooden support (the size is about 230×230 cm.). On these sheets are thickly annotated more than 3,000 information about many places of the world (as it was thought before the discovery of the Americas). In this map is very important the definition of Africa’s geography: in this pasterpiece it is stated that the African continent could be sailed around. This statement was written half a century before the Portuguese explorers tested the feasibility. Well, visitors who want to move with a certain familiarity in the city will have to follow a few simple steps: memorize the shape of Venice (just remember that it looks like a fish), keep in mind to use the cardinal points and remember that there are only three historic bridges crossing the Grand Canal. With these adivices, everything will be easier. 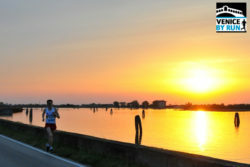 *Stories by run is a weekly column written by Venice by Run for the VMC – Venice Marathon Club events magazine.